Unofficially, Bugs Bunny turns 75 today. It’s unofficial because Warner Bros doesn’t recognize birthdays of fictional characters. But that’s no reason we can’t celebrate! And what better way than looking at Bugs Bunny predictions for the year 2000? 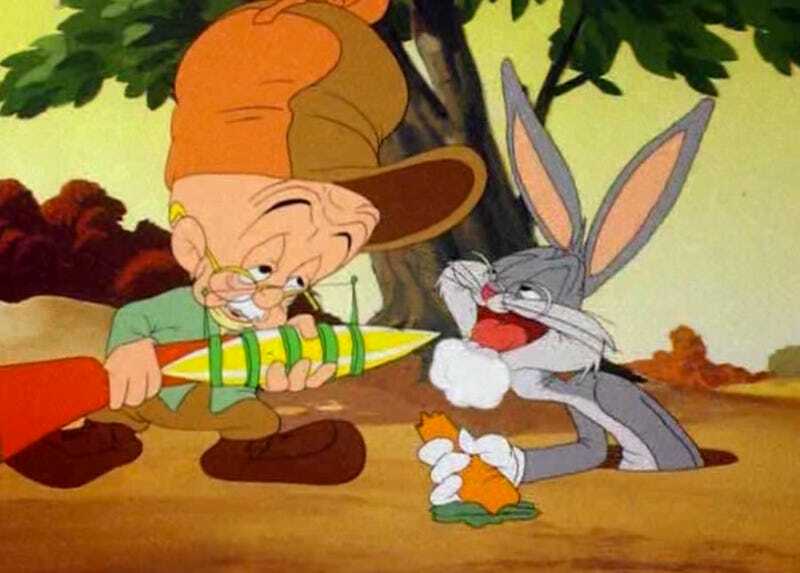 In 1944 Warner Bros released the Bugs Bunny/Elmer Fudd cartoon The Old Grey Hare. Directed by Bob Clampett, viewers get a peek at the futuristic world of the year 2000. Tongue planted firmly in cheek, of course. “Come Elmer, let us look faaaaaaar into the future,” a voice from above declares. What was in store? Rayguns, Smell-e-vision, and streamlined Jetsons-eque architecture — though I should point out that TV was still far from mainstream and The Jetsons was still almost two decades away. Funny how The Jetsons is such an important shorthand for streamlined futurism in the 2010s, even when we’re talking about media that predates it.